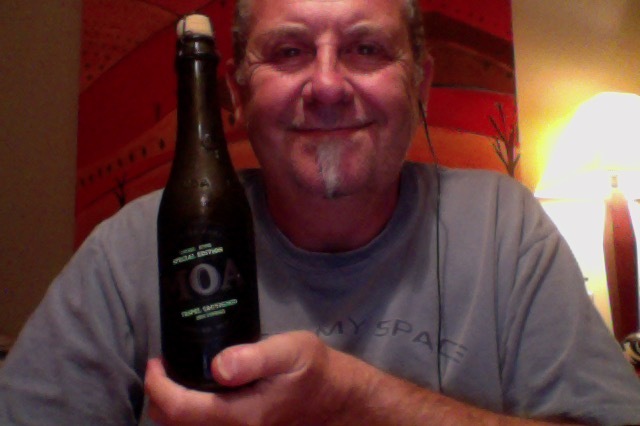 A Moa Tripel Sauvignon 2014 Vintage beer, in a cork and cage special presentation 375 ml bottle, and at 9.3% ABV, makes it 2.8 standard drinks, the bottle would be around 300 calories. A Belgian style Tripel experimental fusion beer where the candi sugar adjunct was replaced with unfermented Sauvignon Blanc grape juice from the 2014 Marlborough harvest. The end result is a beer where the typical Tripel banana and spice fermentation derived characters are complemented by vineous yet fruity and tropical notes. Love the cork and cage, even if it bumps up the pricing, makes it a celebration beer somewhat. That popped with a bit of urgency, so well carbonated. it is very familiar. Alcohol is noticeable too. The initial taste is quite bitter and tart, but with familiar sugars and softness. The finish is towards a dry and arid. I’m really enjoying this, but then I secretly really like the Belgium style beers and would generally be very enthusiastic about them, I like the mouldy mildew kind of thing, I like the over-the-top sweet candy sugars, I like the sour bitterness and I enjoy the colours. There I said it. This does have a fairly noticeable alcohol astringent in it that could be considered a bit of a handicap to some, but it appears to be all up front and not at the back. As it warms slightly you get more of the sauvignon notes and overall it become a bit deeper and some of the more tart notes begin to come through. If I was the brewer I’d be a bit chuffed with this one. The pdubyah-o-meter rates this as a solid 9 of its things from the thing. I might be slightly generous with that number it seems to have been a while between good Belgium beers for me, good ones that is, and when you get one you realise that you should get another. Not quite a desert beer but this is a nice end of drinking finisher. Am I enjoying it? I am a bit blown away by how good this one is. Yes I am. Would I have another? I would be in heaven if I had another, it might be worth getting another for later in the year. Would I share with a friend on a porch and set the world to rights? This is a decent beer that would go well at the end of the evening, with or after the desert, sitting under the stars or in the warmth of the music room. It really is a beer to mull over and enjoy. I know right, be unpredictable and enjoy it all. Are NZ sauvignon blanc the wine world’s IPA? 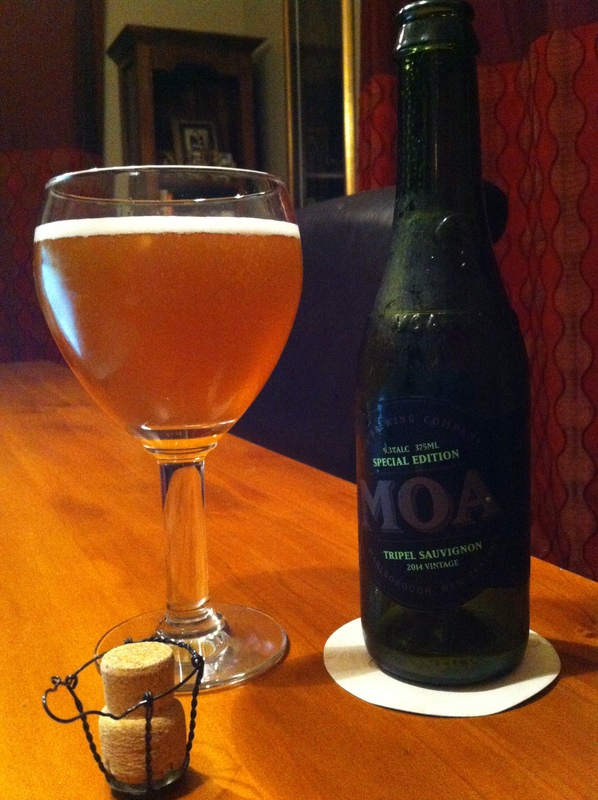 This entry was posted on February 15, 2015 by Philip Walter in Abbey Tripel, Beer, Beer of New Zealand, Beer Review, Craft Beer, Critic, Moa and tagged craft beer, Moa Brewing Company, Moa Tripel Sauvignon 2014 Vintage, Tripel Sauvignon 2014 Vintage.